Apartment, EG, with 2 bedrooms, approx. living space 55 m2, Terrasse, suitable for up to 4 persons. Specialties: Economic Apartment only 300 meters from the bech Price: from 35,00 eur/day. Apartment, EG, with 1 bedroom, approx. living space 34 m2, Terrasse, suitable for up to 2 persons. Specialties: Romantic little retreat place Price: from 42,00 eur/day. Apartment, EG, with 1 bedroom, approx. living space 34 m2, Terrasse, suitable for up to 2 persons. 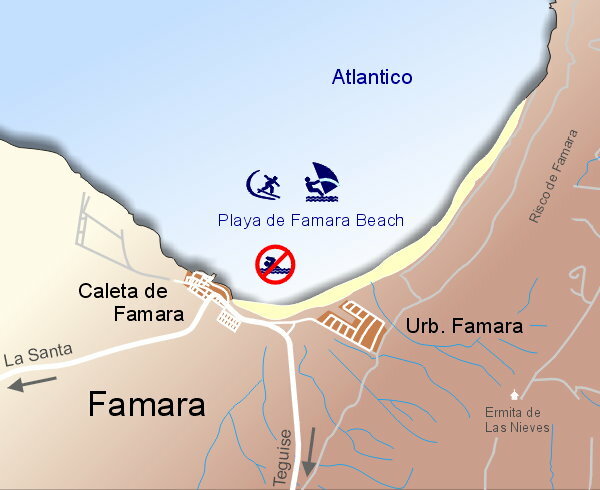 Specialties: Studio apartment with beautiful sea views at the Famara Beach. Beach with naturism area. Internet WLAN on request Price: from 59,00 eur/day. Haus, EG, with 2 bedrooms, approx. living space 75 m2, Terrasse, suitable for up to 4 persons. Specialties: Beautiful beach- and sea views, just 200 meters to the sandy beach of Famara, naturism possible Price: from 65,00 eur/day. Apartment, EG, with 1 bedroom, approx. living space 45 m2, Terrasse, suitable for up to 2 persons. Specialties: Luxurious apartment directly on the beach, beach- and sea view. Beach with naturism area. Internet WLAN on request Price: from 72,00 eur/day. Apartment, EG, with 2 bedrooms, approx. living space 60 m2, Terrasse, suitable for up to 6 persons. Specialties: Luxurious apartment directly on the beach, beach- and sea view. Beach with naturism area. Internet WLAN on request Price: from 81,00 eur/day. Apartment, OG, with 2 bedrooms, approx. living space 70 m2, Balkon, suitable for up to 5 persons. Specialties: Holiday apartment situated directly at the Ocean Price: from 85,00 eur/day. Haus, EG, with 2 bedrooms, approx. living space 80 m2, Terrasse, suitable for up to 4 persons. Specialties: Vacation Villa with fantastic sea and beach views and a private pool Price: from 90,00 eur/day. Haus, EG, with 3 bedrooms, approx. living space 80 m2, Terrasse, suitable for up to 6 persons. Specialties: Old lanzarotenian house, situated directly at the Ocean and at the Beach Price: from 95,00 eur/day.